There are so many good games out this fall. So, so many. There's a type of video game for just about every type of video game player. But there is one thing missing: There's no vast, open-world role-playing game. Bethesda, scions of the vast open-world RPG, have dedicated this year to the fantastic but decidedly not-open-world Dishonored. I had to go somewhere to get my fix of wandering, leveling, and exploring. And so I decided to return to Fallout: New Vegas. Over the past couple of years, I've heard a lot of people rave about the underratedness and overlookedness of Obsidian's take on Bethesda's first-person reinvention of the Fallout universe. I actually played a big chunk of New Vegas when it first came out, but I never finished it. I just sort of ran out of steam not too long after I'd arrived on the strip. Two years later, with a healthy gaming PC and a new appreciation for how much modding can improve these types of games, I thought I'd dig back in. After so, so many hours in Skyrim, I'm increasingly hungry to return to the darker and, frankly, more interesting Fallout universe. (That's a mouthful! But you get it, right? Obsidian made New Vegas, Bethesda just published it.) I've also heard nothing but good things about the New Vegas DLC, which is now so cheap that I couldn't help but download all of it. I'll be writing a few articles about my time in New Vegas—it's a crazy time of year, and I can't guarantee that I'll be able to play the game all the way through or anything, but I've already put in a big chunk of time and have noticed a lot of interesting stuff while doing so. For the first post, I thought I'd write about how I've modded the game to get it looking as good as possible. I haven't gone nearly as overboard with mods as I did with Skyrim; lots of New Vegas mods make the game unstable, and seeing as how it's already pretty crash-y, I wanted to stick with the biggest cosmetic upgrades and not much else. So, here's what I've got installed. These mods, coupled with my solid gaming PC (I'm running an i5 2.8GHz with 8GB of RAM and a GeForce 660Ti) certainly make New Vegas a better-looking, more tweakable, and more interesting game than it was when I played it on Xbox in 2010. Project Nevada is the only overhaul-ish mod I'm using, but it's a heck of an overhaul. It adds all kinds of crap to the game—hotkeys for grenades, a sprint button, bullet-time, stealth modes, cybernetic implants… honestly, it makes New Vegas feel like a much different—and much better—game. I particularly like the cybernetic implants—my sneaky fast-talker now has a stealth mod installed in her chest, and with a press of the "X" button, I can activate a stealth field akin to a Stealth Boy. This is great, since I always hoarded stealth boys in the original game and never used them. To get Project Nevada to work, you'll have to install the latest version of the New Vegas Script Extender, which is very easy to do. Just follow the directions at the site. You'll also have to check the boxes for the four .esm files in the "Plugins" tab in the Nexus Mod Manager. This one does just what it sounds like—it centers the third-person camera. Very nice, as the up-close third person camera is weird and claustrophobic. It's especially good for those early hours when you need to run/jump away from radscorpions to get where you're going. It's much easier to see when one of the little biters is right on your heels. Fellout is a mod that, just like the previous version for Fallout 3, removes the orange tint that the game previously had. It, in combination with a couple of other mods, makes the game a much more welcoming-looking thing, and makes daytime in the desert a more arid, clear affair. I dig it. NMC's texture overhaul for New Vegas is definitely the biggest graphical boost you can give the game, though it can also be a bit persnickety. You can't use the mod manager, and have to extract the archives straight into your New Vegas directory. That's no sweat, but after installing the large version of the pack, my game became hugely unstable. You'll also want to install the 4GB New Vegas Mod, which allows the game to use 4GB of virtual memory. Unfortunately, even with that mod installed, the texture pack caused constant crashes. I downgraded to the medium texture pack, and things are much, much more stable now. The game still looks great, and while it does crash every hour or two, I'm A) not certain the crashes are due to the textures and B) can live with it. Nevada Skies adds a bunch of new weather effects and sky textures to the game, and makes everything that much prettier. This is another big one—I've actually installed the lite version of this mod, since the most recent one forces me to turn off AA and also slows my framerate down. The lite version still looks nice though, and adds a lot of good lighting effects. I generally turn it off when I'm in dungeons, however, as it just makes things too dark. Fortunately, you can turn it off with a simple keystroke at any time. And that's that. There are, of course, a ton of other mods I could install, but I don't want to change the core experience too much—I'm interested in looking back at how the game feels a few years after it came out, and Project Nevada brings enough changes to keep me happy. I've been playing the game sort of casually between other big fall releases, but I've already noticed a lot of things that are interesting, particularly after spending so much time playing Skyrim (and so much more time theorizing about Bethesda's presumed Fallout follow-up). 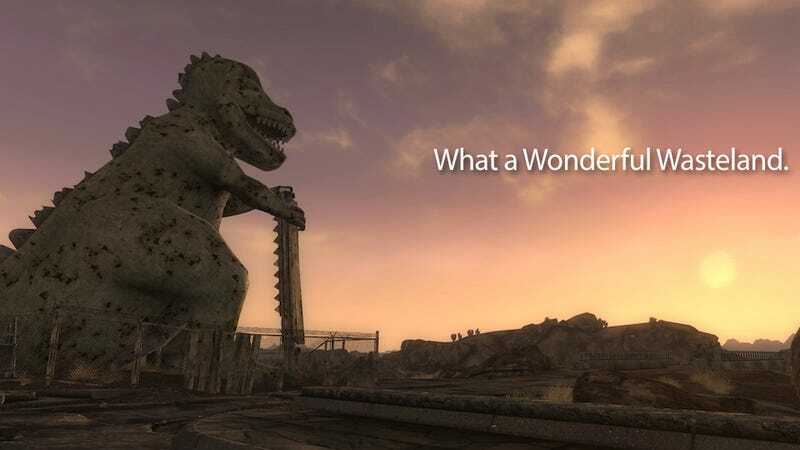 I'll have some more articles throughout the week about New Vegas, and hey, if you've got any free time between the alien-blasting and stealth-stabbing, download some mods and join in.